According to the team, the governments efforts — earmarking funds for specialised farming equipment (for straw management) or enforcing the state-led ban on the practice — are unlikely to solve the problem. Farmer cooperative groups — a key link between government and farmers — ought to be playing a more active role in educating farmers, say key authors associated with the study. The main message is that farmers are not to blame (for the pollution crisis), says Max Friedrich, a post-doctoral researcher at the Swiss Federal Institute of Aquatic Science and Technology (Eawag). There are deeper causes beyond economic incentives or awareness about the health consequences of burning at play. On average, about 20 million tonnes of straw are generated in Punjab, and they barely have two to three weeks to dispose them of and prepare the fields for the next crop. Hence the popularity of deploying stubble-burning as a quick and cheap solution. For about a decade now, the Delhi and the Centre have held this practice responsible for the abysmal air quality in the capital in winter. In 2013, the National Green Tribunal issued a directive to Punjab, Haryana and Uttar Pradesh asking them to ban such stubble burning. 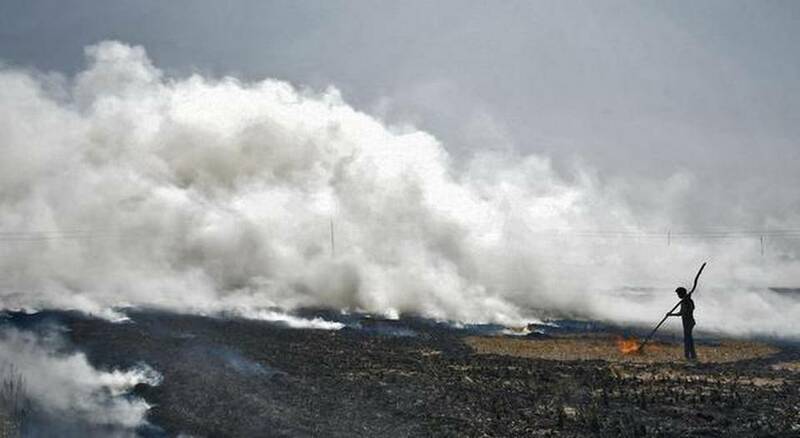 The environment ministers of these States as well as top officials at the Centre declared a zero tolerance policy on the burning of stubble, which has been estimated to contribute anywhere from 7% to 78% of the particulate matter-emission load in Delhi during winter. The Centre has spent about ₹600 crore in subsidising farm equipment via village cooperatives to enable farmers to access them and avoid stubble burning. In 2018, Punjab had disbursed about 8,000 farm implements to individual farmers and set up 4,795 custom hiring centres, from where such machinery could be leased. The cost of hiring these machines was about ₹5,000 an acre, as The Hindu has previously reported. However, the success of these efforts has been mixed, even though stubble-fires in 2018 were fewer than in 2017 and 2016, according to satellite maps by independent researchers. In their interviews, the researchers found that farmers who had bigger landholdings were more likely to burn straw; those who used combine harvesters (for cutting the straw) as opposed to manual labourers were more likely to engage in burning; and those who burnt or didn’t burn were equally aware of the steps and procedures required to abstain from burning, said Dr. Friedrich. On average, the input costs of farmers who burned straw were about ₹40,000 per acre and those who didn’t about ₹25,000 per acre but the incomes of those who burned and those who didn’t were closer — about ₹60,000 and ₹50,000 respectively. There needs to be greater participation by village cooperatives in being able to impose social norms that would dissuade burners, said Banalata Sen, an independent public health professional, associated with the study, coordinated by Ranas Mosler (affiliated to Eawag), the Centre for Sustainable Agriculture (CSA), Hyderabad and Kethi Virasat Mission (KVM), Jaitu, India.